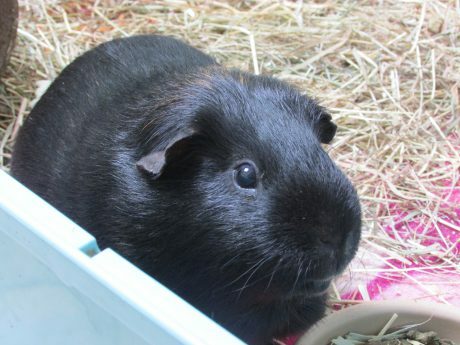 I'm a black guinea pig with a few ginger hairs that I can't really see. 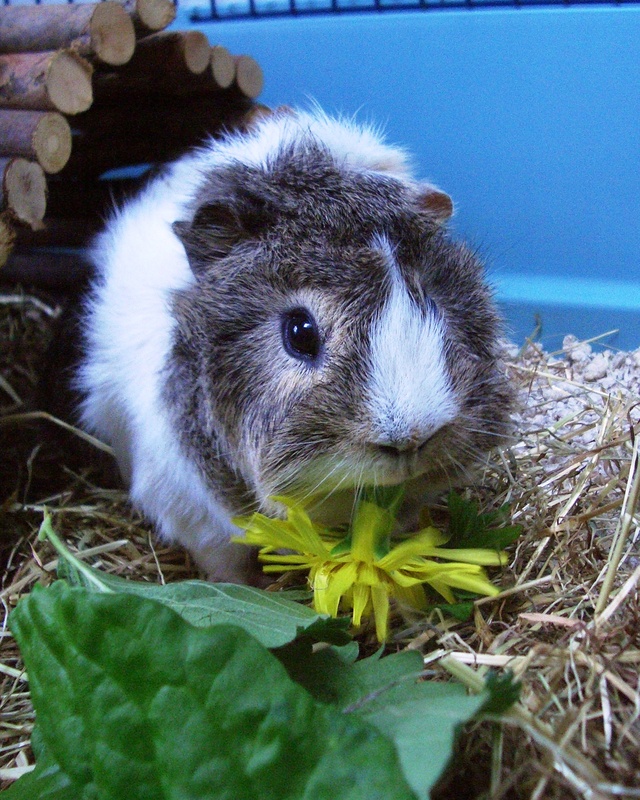 I enjoy stretching out on a pile of hay and being stroked, and eating grass and carrots and other leafy veg. I used to live with a rabbit called Mr Rabbit. 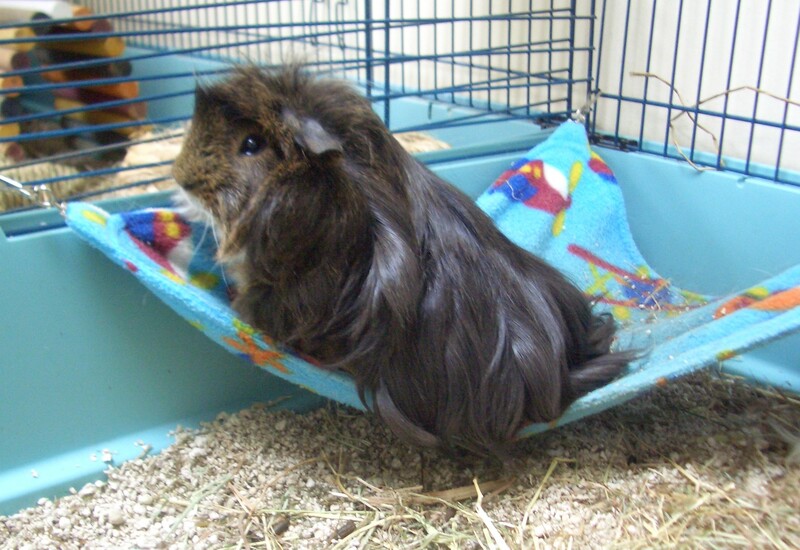 I prefer it here with other guinea pigs, though. Hello, Percy here. I hope you enjoyed the posts from Bertie and Roscoe in the past couple of weeks. I’ve been sitting comfortably on my pile of hay, thinking deep thoughts. Sometimes I sit in my tent, or my tunnel, or on my bed. 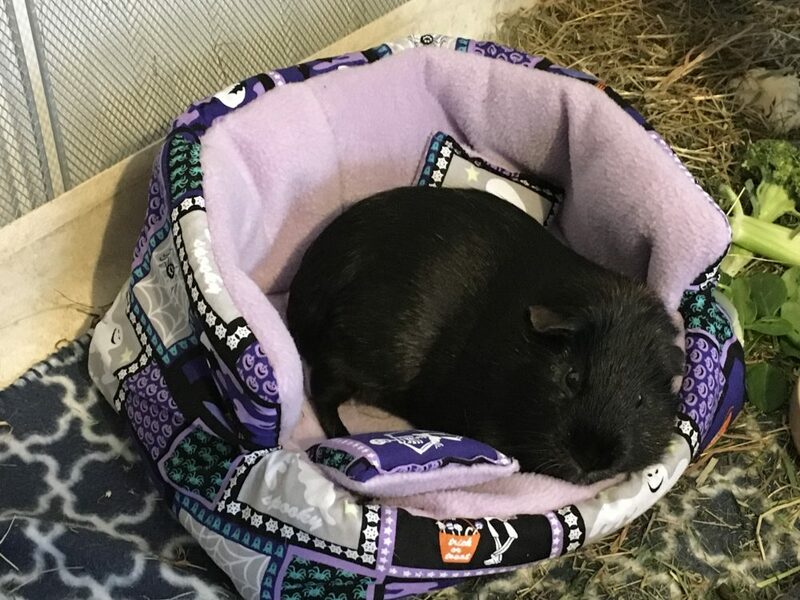 I now have both beds. The newest one, which Midge and I got last autumn came back from the cleaners and I slept in it for a week, because it was Midge’s favourite, but I haven’t slept in it since. Sometimes I go over to the place where Bertie’s cage starts and sit and watch what he’s up to. But then I go back and sleep on my pile of hay. Bertie is funny because he rarely sleeps in his bed. He sleeps half in and half out. Sometimes he puts his head on the bed and his body on the floor, and most times he puts his body in the bed and leans his head over the side. As long as he’s comfortable! I don’t know why I don’t fancy sleeping in either of Midge’s and my beds at the moment. Maybe they just remind me of him. Maybe it’s because he’s not sleeping on top of the tunnel, facing me. It’s only just gone three weeks since he left us, but it seems like months. Then again, it’s a year since Kevin left us, and that seems like forever. Sometimes I wonder where he is and then I remember. I do that with Midge too. It’s funny to think I’ve had my lump all this time since Kevin left us. Dr Sally thinks I’m a wonder. I think that’s a good thing. I’m fed up with my lump, though. Mummy always gives me a big cuddle when I have to have my meds but I’m fed up with having my meds. The chewy ones are okay though. I find it easier to bite things that stay in chunks rather than things that wrap around my teeth, like lettuce. Mummy’s noticed I leave a lot of my breakfast. I can’t really be bothered with it. Bertie usually finishes it off, I think. I like the herbs, though. And the strawberry leaves. And my special pellets. Why does time go fast, and then go slow? Why does it go fast when I’m sleeping, or when the sun’s out? Why is there more time for cuddles in the morning than in the evening? I don’t know the answer to any of these questions. If you know, do tell me. Mummy asked me if one of the others should blog today, but I’m feeling a little better, so I said I’d do it. I want to talk about Midge of course. I felt terrible all Friday and Saturday, but Mummy explained it was all right to grieve for someone, and when that someone was Midge, he was bound to leave a big hole in our lives. I smiled at that, because really, Midge was very large! I met Midge when I arrived here in 2015. He’d already been here a year then. He arrived with his brother Oscar from Auntie Vikki’s home, in the October of 2014. I was surprised at that because he wasn’t living with Oscar then. They fell out before it even got to their first Christmas. I have no idea why. Midge was a very agreeable chap, and although Oscar could be a bit stand-offish, he was okay, really. We got on okay, anyway. I suppose that was the long and the short of it. They got on with everybody except each other. I don’t understand it, but it’s true. Midge and I got together after Kevin died. Kevin lived next door to Midge for a bit, and I’d moved into his cage when Colman died. I think that was how it worked, anyway. It gets confusing. We call it ‘chase the cage’ and see who gets which one whenever a large or more desirable one becomes empty. Anyway, Midge and I got on well most of the time. Recently we’d been bickering a bit. I don’t know who started it, but I think Midge was just touchy about things. You know, a simple thing would make him flare up and tell me off. Mummy says now that maybe that was the start of his illness, but we didn’t realise it. I know she took him to see Dr Sally with me a couple of times, but Dr Sally couldn’t find anything obviously wrong, and Mummy couldn’t give her any definite symptoms. But Midge responded to some metacam, so he was obviously in a little pain. He liked any sort of medicine after that. Mummy shared an artheritis tablet between us in the evening. He liked that. So do I. We liked it even more on Monday, when we got out into the garden for the first time this year. Mmm, fresh grass. Mummy took some photos of everyone, but all you can see of Midge and me is our backs as we lounge in some lovely long grass in the shade. But on Thursday, after Mummy went out to her bird club, Midge staggered around the cage and said he didn’t feel well. Then he fell onto his side and started kicking. It was very frightening for me, I can tell you. I went to see if he was okay, and of course he wasn’t. He was very frightened too. I couldn’t help him back onto his feet and he couldn’t get up, and I could see he wasn’t really hearing anything I was saying to him either. Then Mummy came home, took one look at him, picked him up and cuddled him on her lap for a little while, and gave him some medicine. Then she phoned the vet and talked to Dr Louise. I could hear what she was saying, but it wasn’t very helpful. She asked what diazapan was, and said she didn’t have anything like that. Said ‘yes’ and ‘I see’ a few times, then stopped talking and put the phone down. Then she took Midge downstairs, sorted out our hay and cucumber, and said good night to us. Oh, yes, she told me not to worry about Midge, she was going to sit up with him all night, but he might go across the Rainbow Bridge. Well, I think I thought he might, so I went to bed and tried to sleep. I think Mummy stayed awake most of the night. She had the radio on downstairs. There was nice peaceful music playing. 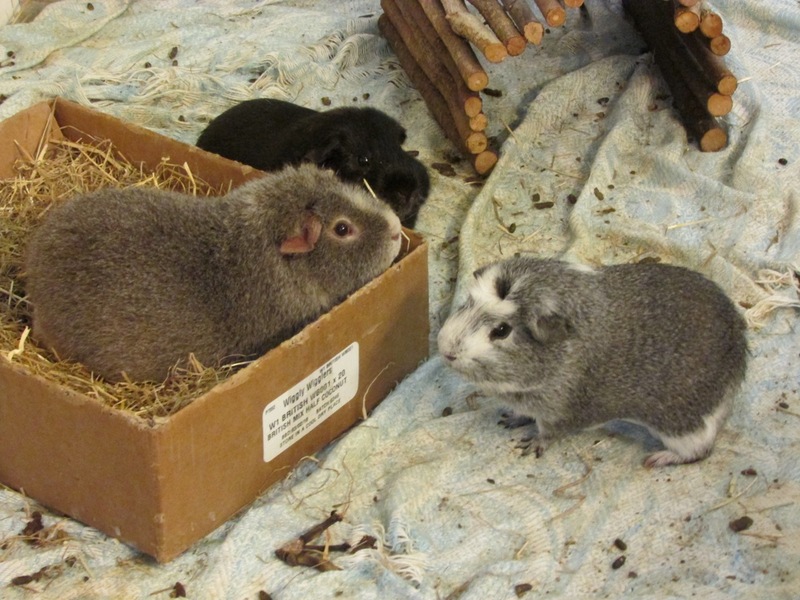 Then in the morning she brought Midge up to sit in the carry box while she sorted out our cuddles and breakfast. He seemed to be sleeping then, but when I came up from floor time he was shaking again. 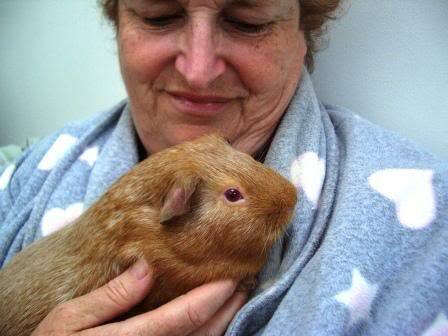 So Mummy took him to the vets, but by the time she got there he’d gone over the Rainbow Bridge. She brought him home and gave us each time to sit with him and say our goodbyes. And since then I’ve been sitting in the corner with a piece of paper we were playing with. It still smells of him. So does the tunnel. I like that. Mummy washed his bed because he died in it and she said I wouldn’t like that smell. I think she’s right. I want to remember Midge like the lovely cuddly chap he was, before he got grumpy, which now we know was his illness talking. He was such a nice companion, and I really enjoyed chatting with him and snuggling up together when we needed a bit of support. He was ever so kind about my lump. Mummy says he may have had a lump on his brain that we couldn’t see. I’m sorry we couldn’t see it, Midge. I hope you’re feeling better now, and I’ll see you again when I come over the Rainbow Bridge. Hello everybody. Percy here again. Although Bertie did ask me if he could start blogging again. He may be back soon, just wait till he has something to talk about other than himself. It’s been a funny week. Mummy seemed to hope we’d be getting out in the garden this weekend, but it didn’t happen. Roscoe reported she’d been outside without her coat on, so we were hopeful, but she said the grass was too damp for us. She did bring us in a big handful on many days, and it was a little damp, but it was freshly picked and very yummy. Saturday she brought us in fresh leaves with roots. I think she calls them weeds, but there was dandelion, sow thistle and chickweed among other things. Then yesterday we had a lot of leaves she grows for us in the garden. Chard, radicchio, salsify (yum), and also some others we weren’t too keen on. A bit too strong for our delicate tastes. It was great to have fresh leaves, though. 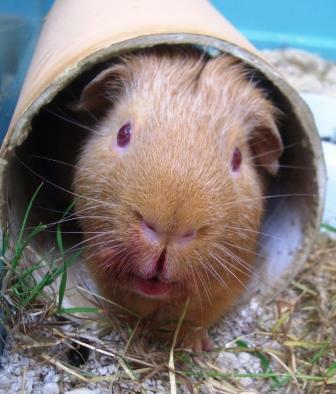 Mummy had a good look at my teeth yesterday and asked me why I had my lower jaw over to the right. I didn’t know, it just did that of its own accord. She felt around my jawline and said she thought my lump had gone down my neck a bit, and wrapped around the hinge of my jaw. She’s started giving me metacam again. Seems all right to me. I thought you’d like to know, though. I hope we go out on the grass this week. Keep your fingers crossed for us, please. Hello everybody. 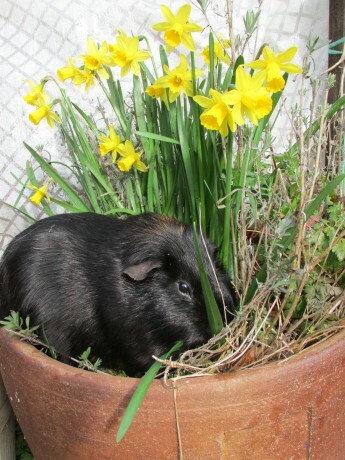 Happy Easter from me, Percy, and all the others here at George’s Guinea Pig World. We had a nice couple of days last week and Mummy brought us in a little bit of grass on one of them. She said the grass isn’t growing as much as it did before the snow, though. And then, guess what? It snowed again last night! It turned to rain agin, but it’s still too cold out there for us to go outside. Mummy’s been very busy cleaning and tidying. She stands by her box of paper and tears it up for hours on end, then she takes the box downstairs and comes back with it all empty. Then she fills it up again. It’s funny to watch her, but I suppose it’s a bit like eating hay. As soon as you finish, more arrives. I’ve stopped taking my metacam for a bit. Mummy says there’s no sign of my lump, and if it comes back I can have the metacam again. I’m having the nutrimed instead, which is also supposed to help keep the lump down. Nutrimed is better for me because it’s not so strong and better for my kidneys. But sometimes metacam is the right thing to have, and sometimes nutrimed is better. I’m happy if Mummy’s happy. She’s giving me and Midge both a Joint Support tablet in the evening, and I think that is doing both of us good. Midge seems much less grouchy now he’s having that. 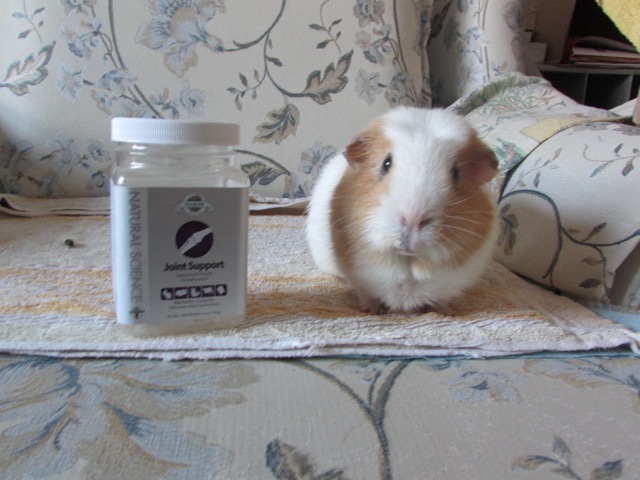 It has something called glucosamine in it, and it’s good for our joints. 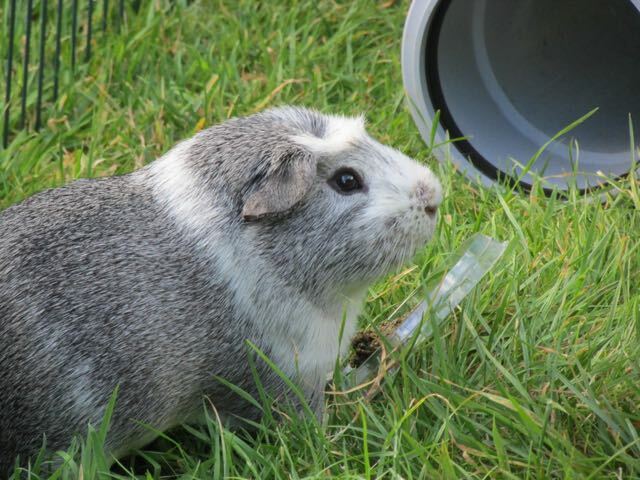 This is Kevin with the Joint Support bottle. Bertie gets very jealous if he doesn’t have something, so Mummy gives him a few pellets of our Pro-Fibre. He loves them! Well, so do we. We have a small scoop each in the evening. It helps our digestion. Midge likes them because it means we’ve got more in our foodbowl. He loves eating out of his food bowl. I do too, but not as much as Midge does. Anyway, we’re all well, and everyone downstairs is fine, too. I know, because I usually get to have a quick chat to Neville in the morning before Mummy puts me back after my run. See you in a couple of weeks. Percy here. I know we said this before, but my lump has more or less disappeared again. In fact it’s been tiny for the last couple of weeks. Mummy has felt my chin and jaw very carefully, and says if she didn’t know it was there, she certainly wouldn’t find it. I said “does that mean I don’t have to have my meds any more?” Even though I don’t have as much as after I went to Dr Simon, I’m still having one dose of metacam and my nutrimed daily. “Oh, yes,” I said. What happened then was after a few weeks my lump grew so big Mummy thought it was The End. I don’t want that to happen. I mean, it’s nearly time for fresh grass and running in the sunshine. So I’m still having a small dose of my meds, and Mummy said she’ll ask Dr Sally if maybe I drop to metacam every other day. It isn’t sunshine and grass weather yet. There was a little bit of grass we had from the garden about a month ago, but we’ve had none since before Mummy went out for the week that Auntie Vikki visited. Roscoe showed you some of the pics from that last week, but here are some more. Look how sleek my left cheek is! This weekend we had snow again, but not as bad as before. Mummy says she hopes we’ll be into spring soon, and it’s Easter next weekend, so things will start Looking Up. 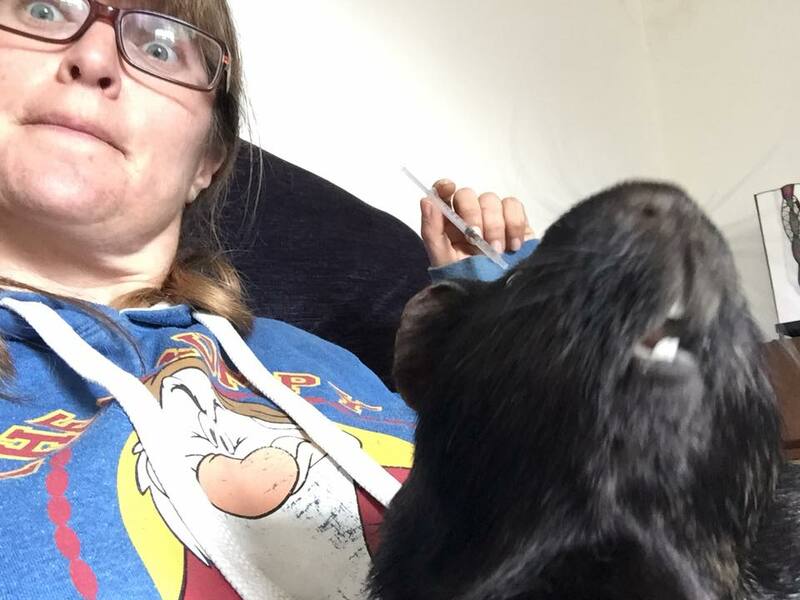 I do a lot of Looking Up but I generally only see Mummy coming towards me, or the light shining down, or the top of my cage. Maybe everything Looks Up when the sun shines, though, and that’s what Mummy means. Apparently these daffodils are just coming into bloom, so maybe that’s the signal for us to go outside soon. This pic was from two years ago, I think. Oh yes, the date is on it. Mummy’s URI has nearly cleared up. She still coughs sometimes, but the worst of the snorting seems over. I think she needs to go out in the garden more, but it’s not warm enough for her, either. The test is whether she can sit outside without a coat on. I’ll keep you informed. Hi there, Percy here again. 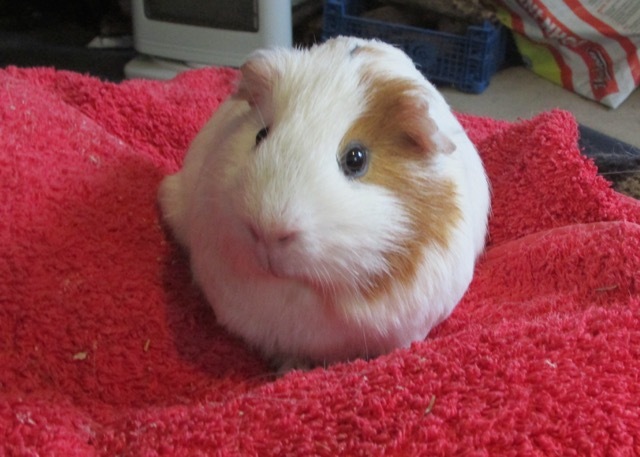 This is the five hundredth post on George’s Guinea Pig World. I am very honoured. 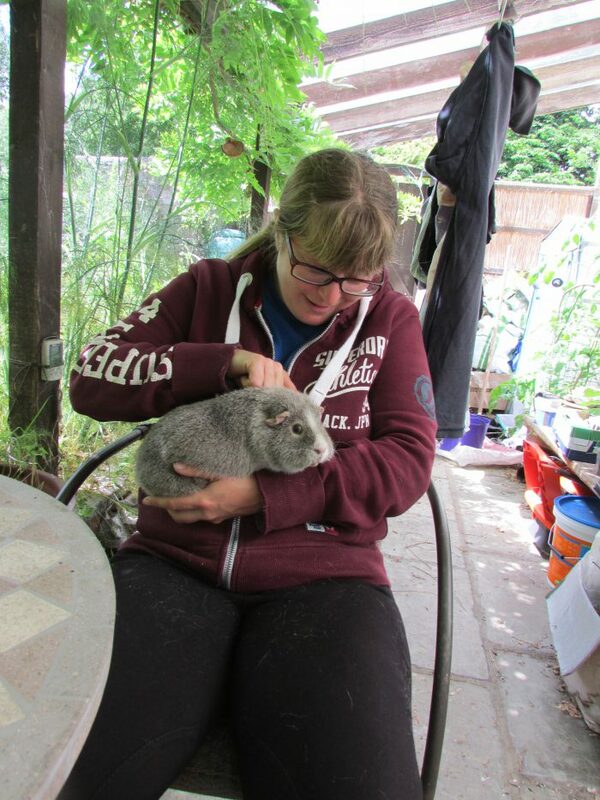 I thought I’d better give you a run-down of who’s been posting in George’s Guinea Pig World (with their funny usernames), although you probably know them better than I do, because you have a longer memory than me. George started it all. I don’t know if Mummy suggested it or he did. You can still read his original introduction to the blog. He first blogged on 8th May 2009, with two posts, one about favourite foods, and the other about having his grease gland cleaned. He did 63 posts, the last one was on 1st May 2011, which was about Hector’s first birthday. A lot of his posts are about visits to the dentist, because George had bad teeth and lots of operations. Mummy says I remind her of him sometimes, especially when I’m being stoical. I had to look that word up. Fred was George’s brother, and he took over when George died. He’s a little more intellectual than George. He started some new posts about the way the world works, and left one to be published on the spring equinox. That surprised Mummy because he died the November beforehand. He just missed George too much. It seems to be that way with brothers that live together. Fred did 51 posts including his memories of George on the day before he died. 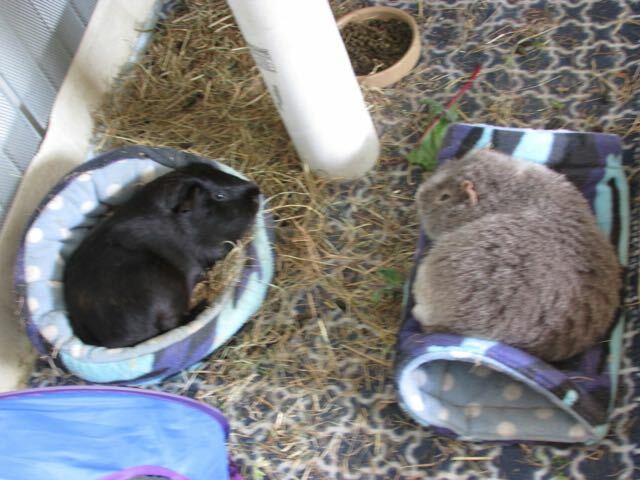 Victor took over from Fred, after 18th November 2011, although he’d stepped in once before when George couldn’t post because he was in hospital. He had a style of his own, but he settled down to proper English eventually. He did 93 posts, including an AtoZ Challenge on the theme of food (good theme!). He alternated with Dylan for a while, then Dylan lost interest for a bit. Hm, sounds a little like Bertie. 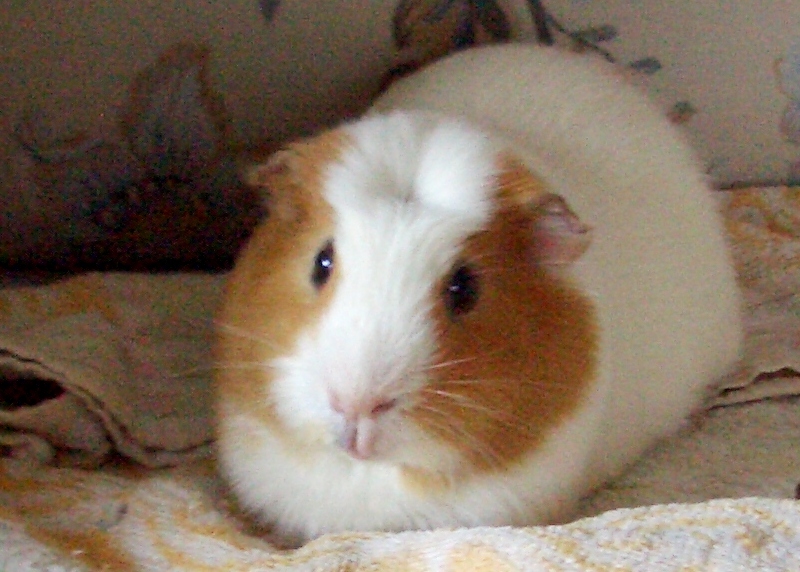 Then Victor continued on his own until he died in May 2013. I think Victor did lots of interesting posts. Dylan’s first post was a very short introduction when Victor was doing the A to Z Challenge in April 2012. Dylan was only four or five months old then. He blogged off and on until Victor died, when he took over. His posts are really very good; he puts a lot of his personality into them. He got to report on the Jubilee Party in the Park, which we’ve never managed to replicate because there’s always someone who will pick a fight (Bertie). He also reported on his ninja capabilities (probably outside the ninja code). He did an AtoZ Challenge with Kevin, talking about guinea pig friends, which is useful because a lot of them are in Mummy’s books. He did 110 posts in all, so he was very industrious in spite of forgetting several times. Kevin joined in just before the Ato Z Challenge with Dylan. Kevin always sounds very reasonable, but then he was. He was clever without being a cleversticks (Dylan). He had an amazing life, like Colman, and he told us about it a few times. In fact his first post was Colman for the AtoZ Challenge, but he’d been looking after the Facebook page before that, so he knew how to talk to people. He only blogged 58 times, but they were really good posts, including guest interviews with people, like Auntie Dawn. Maybe I should do some more. He died in May, after getting a lumpy neck after Colman died. I’d started to help out, and we did the A to Z together on the theme of things we liked. That was only last year. I still miss him. I was the next Blogger to take over. I first posted on 4th April 2016, and got Kevin to check it for me. I did a post called The Last of the Jubilee Seven when Kevin went over the Bridge. This is my seventy-third post! I wonder if I’ll manage to get past Victor? Sigh. What to say about Bertie? He’s a nightmare, although he can be very sweet. So far he’s done sixteen posts, and most of them are me, me, me. He’ll probably improve as he grows up, and maybe he’ll be back again in future. Roscoe has only just started, as you know. He’s a nice chap. I like him. 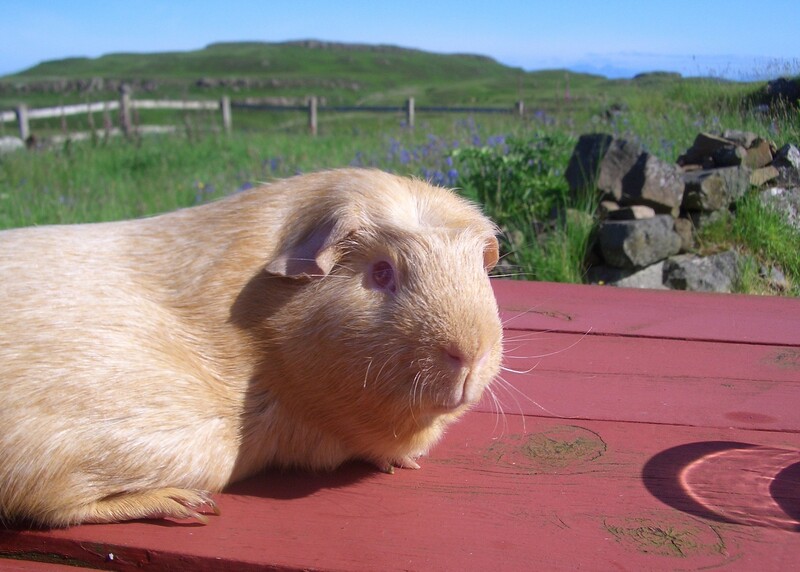 I could do with spending more time with him, in truth, but I expect when we get grass time we’ll get more time to chat. That shouldn’t be long now. Although it was snowing again last week. Roscoe’s done three posts so far, and they’ve all been interesting, haven’t they. So that’s us, and I hope the posts add to 500. Well, they don’t, because sometimes Mummy posts things (32), especially memorials, and occasionally other things. People who’ve lived here who haven’t posted are Hugo, Hector, Humphrey, Colman, Oscar and Midge. I wonder why. I’ll ask Midge and tell you next time. Oh, and I’d just like to thank Auntie Vikki for coming in and seeing us this week. It’s been great.